Since the first version of the Linux school server solution in 1999, more than 15 years of experience have gone into this school server solution linuxmuster.net. A transparent further development by teachers for teachers guarantees the users a system adapted to the special conditions in the school. Requirements from everyday life are continuously incorporated into the development process. The goal of the foundation of the association was and is to bring forward the experiences and solutions that are connected with linuxmuster.net and to make optimal use of the associated resources. We rely on an independent solution that meets the needs of schools. The users are given all possibilities for an individual adaptation and free extension of the solution. 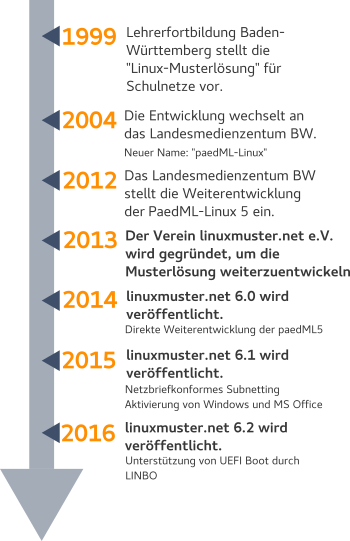 Last but not least the circle of active developers has grown, the development of linuxmuster.net has increased significantly in speed and bugs are fixed faster. Also the constantly growing number of members speaks for the success model of the free school server solution linuxmuster.net. Become a member and support the project.